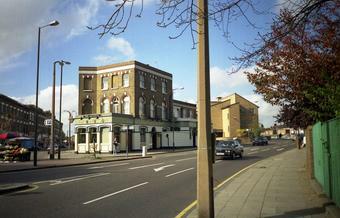 Used to be full of old Irish guys steadily drinking Guinness and Rastas drinking cans of red stripe bought from the offie across the road. Less interesting than it sounds, but exactly as dodgy. Local council estates were another dependable pool of regulars. Location doesn't do it many favours, little in the way of passing trade so often empty. Ruddles smoooooth (�3) and Budvar on tap along with the usual suspects (no cask); oi'll give it foive. 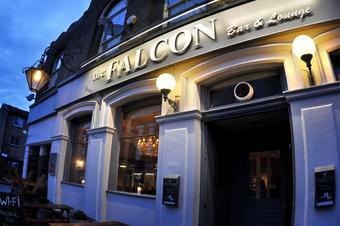 No longer intimidating and old fashioned, the modern day Falcon is completely unrecognisable from the pub of old. Now boasting Chesterfield sofas; chandeliers; stencil wall art; multicoloured lighting; and unique clock features (among other improvements), each area of the pub has gained its own distinctive feel. The choice of drinks and snacks available now dwarf what was previously on offer; prices are fair; staff are friendly, and the facilities are much brighter, cleaner and nicer to use. Recommended. Agreed. The Sunday afternoon cabaret makes this place special.